The term ‘cloud computing’ is being discussed a lot recently and not only by those involved in IT, but as it’s still a relatively new concept; There are plenty of us who don’t really have any idea what it’s all about. Put very simply it claims to benefit, and even revolutionize, the way businesses are run by offering a range of applications and services over the internet. 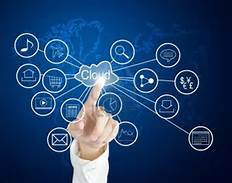 Every business can profit from cloud computing as it helps to eliminate business barriers which in turn leads to increased efficiency in running your business. The other advantage is that you have access to the latest cloud technology. SaaS (Software as a Service), IaaS (Infrastructure as a Service), Desktop as a Service (DaaS), back up, disaster recovery, data storage and much more are just some of the services it’s able to offer businesses no matter how big or small. Ideal for those intending to start a new business it can be facilitated to set up an IT network that involves only those services and programs necessary, as there’s no need to buy expensive IT hardware; And you only have to pay for what you use, so this makes serious business sense. Paying only for what you use on a monthy basis means you keep your expenses low, then once business starts to pick up you can simply add additional features as they’re required – keeping set-up costs to a minimum at a time when you don’t have much profit coming in means your new business is off to a healthy start. People can be employed on a freelance basis which saves you money in employee wages and office costs as personnel can work from home just as easily. Employees have the option of working anywhere as long as it has internet connection which gives a higher level of flexibility, scalability and consistency. This also eases the workload on support staff. Is your business growing rapidly? If you intend to expand in the near future then consider a cloud infrastructure as it allows for on demand scalability, in other words you can make decisions and carry them out very quickly. This could include opening another branch of your company or even an international office, or business might be so good you need to quickly employ more people to join the team or double the number of projects you can complete each month. The ability to access software via the internet means you always have the most up-to-date version, having the latest software is a huge benefit for a company as it puts you well ahead of competition and will attract those big name clients. One of the main benefits of cloud computing is the provision of a back-up service. Everyone dreads systems failing and to prevent losing important files and data it’s vital they’re constantly being backed up. The Back up as a Service (online data backup) eliminates the need to back up data manually and is crucial for a business environment as files can be quickly recovered reducing downtime and increasing productivity. You can also minimize financial risk by subscribing to a service as they’ll take care of all the IT services, from updating the software and infrastructure to maintaining security, as you pay for the service on a monthly basis it means you can keep an eye on, and control, business expenditure. Top of the line physical and virtual security ensures that business never has to stop during a busy period as they’ll maintain your service and provide accessibility and recoverability with an online disaster recovery solution. Want to find out more? Just look online, cloud computing explained in very simple terms is available. Check out cloud computing Australia where software and hardware specialists make certain your IT investment is suitable for your business needs. Put yourself in the cloud today and appreciate the advantages of a hosted solution. The ability to use computing resources and platforms only when you need them, coupled with an IT infrastructure that’s dynamic, scalable and cost effective can only be a winner. Source: ArticleCity by Author Michiel Van Kets; He writes articles for HarbourIT about finding the most reliable service provider of cloud computing Australia has to offer. Contact HarbourIT today to have cloud computing explained to you and learn about the benefits of cloud computing.